Likes: Snuggling on the couch. Dislikes: Little scared of being picked up still but loves attention. 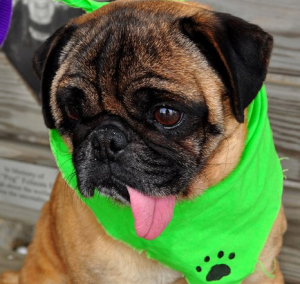 Julie is a female fawn pug. She was born in October of 2004. She is 16.2 lbs, and her jaw is not straight, which is why her tongue hangs out. She gets a little scared when we try to get her to pick her up to take outside or put in her crate. She really doesn’t like her crate trying to not go into it and barking/crying once in her crate. She really is a lover though. She sits with us and snuggles close on the couch. She always wants to be where we are in the house. She is definitely loving the good life. She is still having some accidents but seems to be better understanding the potty training thing. She goes to the bathroom outside pretty quick than she used to so I think she is figuring out what outside is for.